My friend Rae (Made by Rae) recently launched her newest pattern, Jade. I always jump for joy when Rae has a new pattern out. It happened to come at the most perfect time – when I was sewing last minute things for quilt market. I had already sewn the Cleo skirt to wear at one of the days of the show, but needed a top to go with it. So in my usual fashion, I sewed up this Jade the night before I left town. I came super close to making a different knit top that I had already made before, but the Jade was too tempting. New shiny Jade was staring right at me. Lucky for me it was a very quick one to print, tape together, cut out and sew! It’s my favorite kind of sewing. 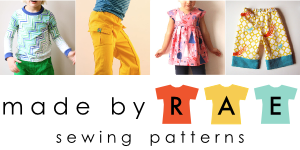 I love that Rae is so good about showing what she wears with her patterns and how she combines them to make beautiful outfits. Having seen the Cleo and Jade together made it such an easy choice to sew. I promise to show the Cleo Skirt once it gets closer to the Forage release date, but for now I love how my Jade top is perfect for summer, too. So more about the Jade shirt! I chose the boat neckline and elbow length sleeves. I feel like I’m at the point where I’ve sewn a lot of knit shirts and I absolutely love the neckline on this one. The way Rae has you finish the neckline looks so pro, even when you’re just using your regular sewing machine. I happened to have a couple yards of the Dana Knit by Robert Kaufman in my stash – already washed!!! A miracle! I really love all the colors in the Dana Knits, and this Storm Blue color is divine. It feels sophisticated to put it on. I wore it all day at market and it felt like the most comfy outfit ever, secret pajamas for real. I’m making more for summer because I keep looking at the shirts at target and then realize I have so many nicer fabrics I can use and make at home. So needless to say, I need new t-shirts, and am excited to make more Jades. Love how yours turned out, that’s a dreamy dana color!